MAY 2017: With no updates in a few years, this page is clearly primarily a historical document and should not be used as representing the current state of the art. Many of the links here are broken, and I am not inclined to update them. This page is slated for deletion eventually. To get the latest EDR information, I suggest taking the IPTM class on using EDR in Crash Reconstruction, or perhaps one of the others out there. The generic term for any device which records information about particular events, such as crashes or airbag deployments, is commonly called (intuitively enough) an Event Data Recorder, or EDR. There are some dedicated OEM and aftermarket EDR systems for airplanes, Railroad Engines, ships, and heavy trucks. There are some aftermarket passenger vehicle EDR-systems which are usually used for fleet applications. I'm not going to discuss any of those. No passenger vehicles currently sold in the US have a dedicated EDR system. The closest thing we've got is that some cars have some EDR functionality built into various components. This functionality is usually found in the airbag contol module (ACM), but may also be found in the engine controller or Powertrain Control Module (PCM) of some vehicles. THESE are what I'll be discussing on this webpage. For ACMs the real job is to monitor the car's status, determine when the car is experiencing an event which meets airbag deployment criteria, and deploy the belt tensioners/airbags/etc. in a timely fashion. The module is working in a black closet with almost no information about the car and none about the environment and is trying to predict what's coming! The EDR-aspects of ACM (and PCM) functionality have been a secondary job at best. The goal of such recording was initially contemplated as a means of providing information to investigators about the actual crash environment the module was experiencing when it decided to either fire the bags or not. Better understanding of how crashes occur in the real world and what causes people to get hurt can lead to an improvement in overall safety for everyone. The diagnostic kit required to access the currently available crop of EDRs is sold by Bosch (who purchased this business unit from Vetronix a few years ago), and is called the Crash Data Retrieval System, or CDR-Tool. Because Vetronix originally sold these devices, you still sometimes hear their name come up, but they are out of this business, AFAIK. These EDR systems do not record audio (voices) or video, direction of travel, location, date, time, who is in the car, phone operation, or any history regarding where you've been or how fast you have driven (except for the few seconds prior to a crash, as noted below). There may be some other systems which contain some of those things, like OnStar, but the "black box" of the EDR does not, and that's all I'm discussing here, and it's all the CDR kit can access. The data from these EDR modules has been used in crash investigations across the country to help determine what happened during a crash. It has also been used in legal matters to clear or convict people. Harris Technical used to keep a list of legal cases and state laws regarding EDRs, but they have discontinued that page. State law info can be found by clicking here to visit NCSL. Questions of data ownership and accessibility to various types of investigators has also been a topic of much discussion. These issues had been getting settled slowly on a state-by-state basis through legislation and case law, but the Feds finally stepped in. THIS IS NEW: In December 2015, the Driver Privacy Act of 2015 was enacted. See section 34302 on the congress.gov website HERE. Specifically, data belongs to the owner or lessee of the vehicle, and said owner or lessee must provide written, electronic, or recorded audio consent to the retrieval of the data for any purpose, with a court order exception and a few others. Up to now, manufacturers have each approached EDRs in their own way, but in August 2006, NHTSA issued a rule governing what data an EDR must record when a car has one. In January 2008, they issued their updated Final Rule which addressed some of the petitions they got after the first Rule was announced. It now applies to cars built after 01SEP2012. It mandates a list of things that an EDR must record if the car has an EDR which is intended to be downloaded after a crash. Think about that for a moment: if a car doesn't have an EDR intended to be downloaded after a crash, then the rule does not apply. As with many laws, this 200+ page beast will require some legal interpretation as it gets implemented. Many cars, though, already have some form of EDR in them, and NHTSA has said that if manufacturers stop putting EDR functionality in their cars, NHTSA will revisit the issue of mandating them. The regulation is technically called "49CFR Part 563", but I'll just call it The 563 Rule. The actual text from the 14JAN08 Federal Register can be downloaded in PDF format by CLICKING HERE. you can find the original (now obsolete) rule online if you look about a bit. In addition to specifying what data must be recorded and at what rates, the 563 Rule includes some survivability requirements (which should be a piece of cake for current EDRs, IMHO). The "must-record" data includes some pre-crash data as well as a lengthy crash pulse. The Rule also requires manufacturers make a tool or translation device to download that data available to the public within 90 days of a car’s release for sale. It does not require them to give away these decoding devices, but rather that they be commerically available. Affordability is not addressed. The Rule does not require that Bosch be the outlet, and I am sure there will soon be more players in the EDR-downloading equipment market. The Bosch kit may continue as the only device to access GM/Ford/Chrysler/some others, but there will probably be kits from one or more other companies (i.e. OTC, B&B, Drew, or the OEM themselves) to access the other dozen or so manufacturers whose products will be covered by the rule. 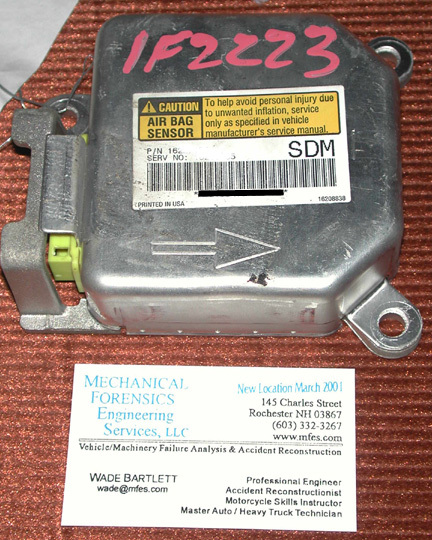 To the right is an example of an airbag control module from a GM vehicle (click on the thumbnail for the full picture). GM calls these units Sensing and Diagnostic Modules (SDM), while the Ford version is called a Restraint Control Module (RCM). You'll notice that it's not BLACK, despite the common terminology. They have almost all been silver or grey until recent years, when a few have gone to having black plastic cases. The SDMs typically measure about 4x4 inches across, and are about 1.5 inches high, with a big yellow plug on one end and an arrow to indicate FORWARD as installed. Yellow plugs are used throughout the airbag system in all US cars. MFES is one of the several hundred companies nationwide equipped with the CDR system (shown in the photo to the left), having been one of the very earliest adopters of this technology. The CDR system can download many airbag modules after an airbag deployment or in some cases, a non-deployment event. It is the same tool used by NHTSA, GM, Ford, Chrysler, and now Toyota in their own investigations. The coverage, locations, what pre-impact and post-impact data gets collected, and best data retrieval procedures vary by manufacturer, so this page will discuss each separately. DOES THIS VEHICLE HAVE ANY EDR FUNCTIONALITY AND IS IT COVERED BY THE CDR-KIT? Version 3.0 shipped in January 2008, which included the addition of several Chrysler products. Version 3.5 shipped in 2010. Version 4.x arrived in 2011 and included some Toyota coverage. We have heard that version 5.0 will ship some time in mid-2012 and will include Honda coverage. The vehicle coverage list for various software versions can be found on the Crash Data Group website. Of all the OEMs, GM has the largest number of models with publicly accessible data. Some data exists in some GM models as early as 1994, though pre-2000 GM cars contained driver's seatbelt status (buckled/unbuckled), some airbag system diagnostic information, and the crash pulse, but no pre-crash data. The 2000 and newer cars generally include those things along with the vehicle speed, brake status (ON/OFF), throttle position, and engine RPM for about 5 seconds prior to impact. Though there are exceptions to both of these generalizations. There are some exceptions to both those thumbnail guides. Newer cars may only record a non-deployment if the Delta-V is over 8kph (5mph). Starting in 2011, the term Deployment Level Event has been dropped, and the file storage organization is changing from having one slot of Deployment event data and one slot of Non-Deployment data, to having three slots for any data. The 2012 Volt is the first vehicle they consider to be Rule 563-compliant. Be sure to read the data limitations on any file you're looking at....this is sometimes called a "Reading Intensive Activity". The Isuzu and Saab coverage is very limited. Ford coverage on some models goes back to 2001, but is much less comprehensive than GM, though the list of covered vehicles is growing with each update. There are a bunch of Ford RCMs not covered by either 2.8 or 2.9 that we will probably never get access to for what have been termed "internal/supplier" reasons. As of now, Ford is moving away from using the PCM to store data, with te EDR functionality centered on the RCM. There are a HOARD of warnings associated with PCM-data loss resulting from improper handling...which can be as simple as turning on the ignition to read the odometer. Be very very careful with any Ford listed as having PCM data in it, and get someone who has the right equipment to do the download. Chrysler and Bosch inked a deal in 2006 or so, and coverage has been slowing coming along starting in early 2008 with Ver.3, with some models covered back to 2005. This does NOT include any Mercedes models, as they are two separate entities again. The Chrysler add-on included a LOT of new direct-to-module cables. Even though I have a software update subscription, the new hardware cost me $1300. Ouch. As of Jan 2012, Chrysler is now owned by Fiat, and they are rolling out Fiat 500 models in the US, with Bosch coverage starting with Version 4.1, however there were some issues in the early translations. Also, chip-supplier changes forced by the Tsunami have caused massive reverification of the modules, and as a result EDR functionality is diminished for now. As they are able to verify that the new chips in use in their modules are providing reliable data, they'll add those data elements back in the reports. The Owner's Manuals for various '06 and '07 Dodge vehicles contained this interesting blurb: "In the event of an airbag deployment, your vehicle is designed to record up to 2-seconds of specific vehicle data parameters (see the following list) in the event data recorder prior to the moment of airbag deployment. Please note that such data are ONLY recorded if an airbag deploys, and are otherwise unavailable...Parameters that May Be Recorded: DTCs, “Time” of airbag deployment (in terms of ignition cycles and vehicle mileage), Airbag deployment level (if applicable), Seatbelt status, Brake status (service and parking brakes), Accelerator status (including vehicle speed), Engine control status (including engine speed), Cruise control status." I have heard from others who should probably know about such things that Chryslers prior to that really have nothing, and furthermore, Chryslers only record events. There is no recording of non-deployment events. To visit a page that discusses this issue with respect to JEEPS, CLICK HERE. Toyota was long rumored to be in talks with Vetronix, but stepped away from the table back in 2007. The good news is that as of 2011, they are back on board with BOSCH, and have provided backward accessibilty to 2002 for at least one model line. Downloads used to require a visit to or from factory personnel, if you could get it done at all, but this is changing as a result of the 2009-2010 sudden acceleration issue. Toyota supplied multiple proprietary "Read Out Tool" (ROT) download kits to NHTSA in the 2010 timeframe (and perhaps others working on their behalf), for use in their investigations. Click here to view a 1-Meg pdf example of a 2005 Lexus ES330 ROT download, which shows one mystery mild event that looks like a parking-lot type thing, and one non-deployment with a 6mph DV and impact speed of 3.7mph. Toyota had previously stated that they did not believe the system was reliable enough to serve any reconstruction purpose, so they wouldn't provide the data. I don't think anyone in this business really believed them about the uncertain reliability part back then, and this position may come back to bite them, I think, as they now try to use EDR data to support the position that sudden acceleration cases are not the car's fault. In any case, the new CDR-downloads contain a lot of good data, including up to two lateral and two longitudinal events, along with a lifetime "trigger" counter (TGR). They capture pre-trigger speeds (but only up to about 75.8 or 78.3 mph, depending on the module). Some models provide an accelerator pedal voltage (0.78V=idle, 3.5V=WOT), while others have a three-step "Off/Medium/Full" data element instead. A recent SAE paper I co-authored on the accuracy of 2010 and 2011 Camry EDRs showed they are pretty good, but do have some features one must be careful of during interpretation. (SAE 2012-01-0999). It is understood that Honda will join the CDR family in 2012, but coverage will be limited to 2012 models sold in the USA. No coverage for Canadian-bound cars. As a result of this limitation, Bosch will only sell the cables necessary to access these cars. One '05 CRV download done in Japan for a Northern Hemisphere client took months to get, but provided Seatbelt status for driver and right front, Driver's seat position, Passenger seat empty or occupied, Which airbags deployed, and Delta V. The '06 MDX and Acura TL reportedly has seatbelt buckled, seat weight sensor, brake on/off, but no collision pulse. Earlier modules often just have "Parameters for deployment were met" or words to that effect. Some new-platform '06 models reportedly can be accessed by a dealer with the "new computer system" which can scroll through a number of recorded parameters if the battery has not been disconnected for too long. After a time without power, though, this data may go away. According to NHTSA, "65-90% of model year 2004 passenger vehicles" of most manufacturers have some EDR capability built into either their ACM or other on-board systems. NHTSA also noted that "Honda, BMW and other vehicle manufacturers record small amounts of crash data." while they cited Ford, GM, and Toyota as having "what would be considered a large amount of crash data." The Bosch CDR kit is the only publicly available tool to download crash data, and the coverage list cited above should be examined for coverage. The OEM's ability to read their own data remains a hot topic of debate. An '06 Mercedes E350 involved in one case reportedly was downloaded by a road-service-technician from the dealership after some sort of side-event. The data he could access was associated with fault codes for the side curtains or side bags, and included the odometer reading at the time of the event, the current odometer reading, the speed at the time of event, abs on/off, the number of ignition cycles without the fault reoccurring, and brake status (ON/OFF). It's not clear how confident we could be that the speed a fault code being recorded was the speed at the event itself. Perhaps we'll get to do more research on that once the kits become available. Factory download reports for '04 Volvo XC90 show delta-V, crash pulse, vehicle info, and some diagnostic stuff. I thought it was interesting. Volvo continues to be inaccessible by public tools, though. Nissan/Infinity have data that might be accessible by the dealer, but more likely by the manufacturer directly. The modules out there so far reportedly do not have speed, but it might become an available parameter in 2007. Some Hyundai data may be available either by way of the dealer's factory scan tool, or the OTC i-pro scan tool. The OTC website used to say that this tool has "ABS and air bag crash data for OEMs that support it" though it's not clear what that really means, and is no longer listed on their website (July 2010), and some internet chatter I found suggests that the software was not updated after 2002, so maybe not so much, eh? One wonders about their Genisys scanner, though. Reportedly, Audi A3's could store up to 3 crashes, but newer ones get only 1 before requiring replacement. BMW has publicly stated that they don't record data and won't do so until mandated to, because their customers don't want it. That said, I know one law enforcement guy who has seen the printout from a 1999 M3 with speed, occupant status, and some other stuff. Either the M3 was really special, or there's something there that us mortals are just not going to get access to. If the case is big enough, and you've got a search warrant or similar pull, Kia will send someone out from Kia of America in California to download the codes in a crash-involved event. In one pedestrian case with no deployment the effort resulted in no useful data, but in one case with a 2006 Kia Spectra it included an acceleration and delta-V. It's not clear what data might be in there for deployment event for other models or years. Many observers anticipate big changes in this arena with the advent of The 563 Rule, when most everyone will have to make the data available. If they drag their feet too much (either by making public-tools too hard to obtain or disabling their non-compliant modules), NHTSA may step in the way they did with OBDII regs, and nobody wants that, so compliance seems likely, after a fashion. The literature generally concludes that SDMs and RCM do a pretty good job of recording the data they are provided, and that data generally does a pretty good job of describing the vehicle's operational environment during a recorded event. In addition to unpublished work by the OEMs to verify their systems' accuracy, Rusty Haight at CSI has conducted independent testing to compare the SDM recorded data to an IST accelerometer installed in the test car. The results showed good correlation between the two: the GM-CDR reported delta-vees for deployment-level events were within approximately 0.3 miles per hour of those generated by integrating the IST accelerometer data, with crash-durations matching within a few thousandths of a second. For low-speed events (particularly non-deployment events) the SDMs may miss the first few miles per hour change in velocity before the system wakes up, and the algorithm is enabled. This means you gotta be careful in applying this data to this type of event. Rusty's paper with this material was titled "Automobile Event Data Recorder (EDR) Technology - Evolution, Data, and Reliability" and was presented at ITAI in Nov. 2001. It used to be online, but it appears to have been taken down as of July 2010. SAE 2002-01-0679, The Accuracy and Sensitivity of Event Data Recorders in Low-Speed Collisions"
Rick Ruth is "Mr. Ford EDR" and has some info on his web site. A bar-journal article by David King, one of the lead MEA Engineering (formerly MacInnis Eng.) guys. They do a lot of EDR validation stuff. A Washington Post article from 09/09/2003 titled "The Snoop in Your Coupe" , but requires a subscription to access on their website. The Manchester Union Leader published an article on October 10, 2004, featuring your's truly. You have to pay to see it online, now, though - search their archive for "black boxes", pay $2.50. When this stuff was new, I know of two classes provided by Vetronix themselves, but they got out of the training arena. Bosch, similarly, has not been interested in providing classes to CDR-users or the general public. My understanding is that BOSCH no longer "authorizes" or "prefers" any one trainer over another, and lists several training organizations on their website, HERE. Starting around 2005, it became common to hear of two levels of training: Technician and Analyst. The "Technician" level is qualified to get and preserve the data using CDR equipment. The "Analyst" level involves interpreting the data so obtained. The system was used to verify the speed of a Camaro involved in an accident in which an SUV had crossed the center line sideways, and was struck on the right side by an oncoming Camaro. Any doubt about the Camaro's speed was erased when the Vetronix system showed that it had indeed been travelling at about 30 miles per hour during the five seconds prior to the crash, and that the driver had initiated braking one to two seconds prior to impact. Whenever I rent a GM car, I scan the module to see what I find. Usually it's something at low or no speed that looks like a parking-lot incident. A Chevy Impala I rented during a recent trip, however, had a near-deployment at 35mph, with the operator's foot coming off the brake pedal for a couple seconds, but getting back on the brake with 2% throttle application for a couple seconds prior to algorithm enable. Positing potential scenarios for this set of data has been amusing. Some US tax-dollars go to pay for investigations of severe roadway accidents and the results are public documents. Here's the NHTSA Special Crash Investigation (SCI) Search page. If you search for type "Advance Airbag" or "Redesigned Airbag", and tailor the search for vehicles which may have downloadable EDRs, you can hunt down all sorts of stuff including the EDR files, crash diagrams, photos, etc. Sadly, NHTSA changed all the links on their website somewhere around 2011, so all the reports identified below have moved, and you're on your own. Sorry. RPT790049337.pdf this one has 3-cars and 3-downloads! RPT790056158.pdf '97 Buick Skylark hits guardrail, no deploy. RPT790052054.pdf '97 DeVille takes an Olds in the door. RPT393037358.pdf '98 DeVille takes a Jeep in the door. RPT238027019.pdf '00 Silverado tangles with a G20 van and loses. BIG DV. RPT452027190.pdf '01 Chevy pickup with hand-controls rearends slower truck. Long Pulse. Additionally, there have been a number of EDRs downloaded after NHTSA crash testing. the list of those tests can be found at http://www-nrd.nhtsa.dot.gov/database/aspx/eventdata.aspx. The tests listed there include barrier tests, offset frontal, side impact, and car-to-car developmental tests. You can hunt down specific reports using this NHTSA search engine. The online reports for these tests generally include the entire text (usually in PDF format) of the report which is hundreds of pages long, photos before and after, and one or more videos taken at full speed or sometimes high-speed (which plays back like super slow-motion). For this latest software update, Bosch added 2 new OEMs and skipped Ver.7 in honor of the big additions. The 3-year software subscription is no longer available. Bummer. December 07: The Ver 2.9 shipped in April. In June or July there was a patch released to fix some "features" on that early disk, and a couple months ago I got a 2.91 disk in the mail. Some Canadian users have gotten their 2.91 disks only quite recently, there having been some hangup in the cross-border shipment. We're expecting 3.0 soon. I hope. 14March07: Vetronix has advised a fellow user that Ver. 2.9 will be shipping "in the next couple of weeks." Also, the new Belkin USB-Serial converter, which is like a little pigtail worked fine with my CDR with XP. I'm not inclined to try Vista yet! 14Feb07: A couple months ago, Siemens released their final VERONICA report on EDRs in Europe. Not only does it have some familiar names on the list of players (Otte and Steffan jump out immediately), it looks like a great summary of what's out there, and where they think it should go. Sort of parallels some of the NHTSA stuff on this issue leading up to the recent Rule563. Siemens Final Report. 08Feb07: Version 2.9 has been released from engineering. Discs are in the process of being burned now and should be shipping between the 15th and 28th of this month. -Though their website doesn't reflect it just yet (07FEB07), Vetronix is moving to an annual software subscription model for their CDR system. Buy one year ($395) or buy 3 years at a whack for $1185. There might be a discount for conference attendees. Buying 3 years at once locks in the rate, but doesn't get any other financial benefit. This only covers SOFTWARE. -Version 2.9, which is a DLC-only software upgrade which gets access to the RCM in a bunch more Fords and more 06-07 GMs was supposed to ship on Monday 05Feb...Haven't heard if it happened, though. -PCM access with more good stuff will be a hardware upgrade, and should be coming SOON (maybe June-ish? Maybe a little earlier if things go well? ), but will not be covered by the software subscription. I'll talk more about PCMs after we get access to them in our sweaty little hands. -About the same time, a software update should arrive with coverage for one family of Chrysler vehicles (but not Mercedes Benz). More Chrysler coverage will follow. -The 49CFR563 (Part 563 Rule) on EDRs looks to make a lot of headaches for the OEMs, and though standardization is a nice idea, there may be unintended consequences. In part, the rule mandates that IF a vehicle has any recording, it must meet an extensive list of parameters. One unintended side-effect of the rule is that if an OEM has an EDR (maybe even a pretty good EDR) that doesn't meet all the requirements on 9/1/10, they may just disable the units they make after that (maybe by popping the EEPROM out of modules before shipping them?) to avoid breaking the law. We're from the government. We're here to help. -There's a Ver2.81 patch to fix Silverado issues primarily (maybe only? )...It's on the conference CD, it's also reportedly going to be posted at the Vetronix website. If I've understood correctly, the software didn't recognize some supported trucks as actually being supported. -CDR-Tool Kit prices will go up with Ver2.9. A limited number of 2.8Kits are on the shelf at the old price, and when they're gone, they're gone. While I expect NHTSA to use the specter of an OBDii-type mandate to help goad the OEMs into incorporating Rule 563-compliant EDR functionality in their cars, I don't expect plug-standardization (ala the ubiquitous OBDii Diagnostic Link Connector) any time soon. Or ever. We're going to have dozens of little cables in the box. Glad I bought a full-sized van for carrying stuff in! Nov 2006: Vetronix has been bought by Bosch, so some things will probably be changing in the future. Exactly _what_ is not yet clear. -The conference was a good affair. Yours truly gave a presentation on how modules usually tolerate being dunked, but sometimes don't. We did NOT get a new OEM this time around, though we're told it's coming soon. -Ver2.8 has updates for GM and Ford, and comes with two new cables and a new interface box to handle CAN-bus cars. -The Ver 2.8 software will work with the old interface box, but that box can't talk to CAN-bus cars. -If you bought the Ver2.7 back in 2005 - your new cable should be there soon, mine has arrived. -If you bought the Ford add-on, you may have a cable (3274) that needs re-working by Vetronix. -The Chevy Aveo is really a DaeWoo Kalos with unreadable Siemens modules, so it will not be supported by CDR. -Lately, I've been using an old Libretto 50CT for downloads: so small it fits inside the CDR case! June 2004: Version 2.4 is available now...FWIW, The word on the street is that more FORD coverage is coming, but nobody's talking until it's final and it's not final yet. Dec 2003: Vetronix has started shipping a redesigned CDR interface module with new CDR kits. The new CDR module has a new blue enclosure with an updated circuit card designed to output more power, eliminating the need for a CDR power booster adapter. Therefore, you can plug the 02003002 cable directly into the new module. All other functionality is the same as the original design (black module). Ahhhh the joy of upgrades! Oct 2003: The Preferred Customer update kit is now shipping. June 2003: Software Version 2.1 is available at the yahoogroup, some of the cables are still waiting to ship. YAHOOGROUPS E-List An email-group has been formed to share info and download the latest software versions at http://groups.yahoo.com/group/CDRtool/...membership requires attendance at a Vetroinx-approved class. Harris Technical has created a list of CDR users to help people find someone close to home, click their name to go to that page. 2003 GM model years are largely covered by ver 1.68 - currently only accessible via the DLC (cables shipping with Ver 2.0). March 2003: Vetronix has announced that "CDR Preferred Customer Program members who have paid the $395 for a year's subscription to the update service will soon be receiving the v2.0 CD and three cables (1 Ford & 2 GM). These cables support select 2001 - 2003 Ford vehicles and select 2002 - 2003 GM vehicles. In June, members will receive (at no charge) two more cables and an adapter, all GM. These cables support select 1994 - 1998 GM vehicles (02003002 vehicles). Please review the Supported GM Vehicles' list in the Help Files for a complete list of vehicles. This information is also available in the CDR Preferred Customer Program mailing (page 3) that was sent out to all customers and posted on the Yahoo web site. Please review this document for more information." Sent by: James Kerr, Vetronix Corp.
Coverage issues: It has been reported that the '97 W-bodies are NOT covered, and that the '00 GMC Savanna and Chevrolet Express use the new-and-improved SDM-G cable. More coverage Mid-december, Jeff Weger advised me that the 2003 Yukon is supported in version 1.68 via DLC only. Module cables should be available soon. All Software Versions: Overwriting Near-Deployment File During Recovery: Brad Muir also reported that in one vehicle he examined, the deployment occurred at "n" key-cycles, the near-deployment occurred at "n+1" cycles, and the investigation occurred at "n+2" cycles. This appears to be a case of the tow-truck operator turning on the key (perhaps to unlock the front wheels), and bumping the system hard enough to overwrite whatever was in the near-deployment file before. Ver 1.1: Overwriting whole files in your computer: If you are an icon-user, be careful that you do not inadvertently hit the SAVE icon instead of the OPEN icon in the main screen....Given the right circumstances, you could overwrite a previously opened filename with the currently-viewed file, thus wiping all the older file's real data from your computer. 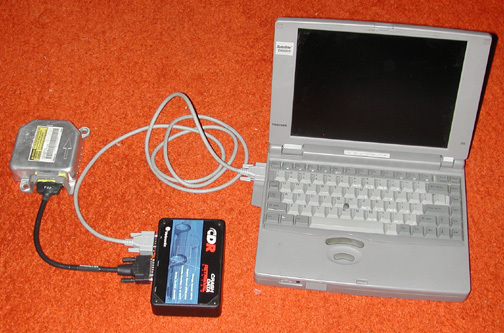 Ver 1.1: Laptop problems Software V1.1 does not allow the user to change inputs from COM1 to LPT1, which means that laptops which have but no 9-pin serial port(COM1) won't work unless you buy a serial-to-USB converter (for about $70). CDR software version 1.2 is reportedly now in Beta testing, and may address this issue. Ver 1.1 is not compatible with Windows ME but Ver1.2 (due out Feb 01) should be. Software Ver 1.3 has been shipped, some newer updates are available through the yahoogroups e-list mentioned above. These worked fine with my Windows-ME, through a Belkin USB-Serial connector.